Dynamic Surroundings alters the player’s visual and audible experience in Minecraft, and does not alter game mechanics. The player has a high degree of control over their experience, and modpack authors can customize biome and block effects based on their need. Discussion thread can be found on the Feed the Beast forums. NOTE: The JARs I build are published only to CurseForge. I cannot vouch for the JARs found on other sites because I do not know their origin. Starting with v3.5.4.0, the HUDs have been moved into a separate mod called Dynamic Surroundings: HUDs. The HUDs mod will not run with earlier versions of Dynamic Surroundings so make sure you update your mods appropriately. Installing the mod is pretty easy! Just drop the JAR into the "mods" folder in your Minecraft Forge instance and startup your client. The mod is not needed on the server so you can drop into an existing modpack and play on public servers without problem. 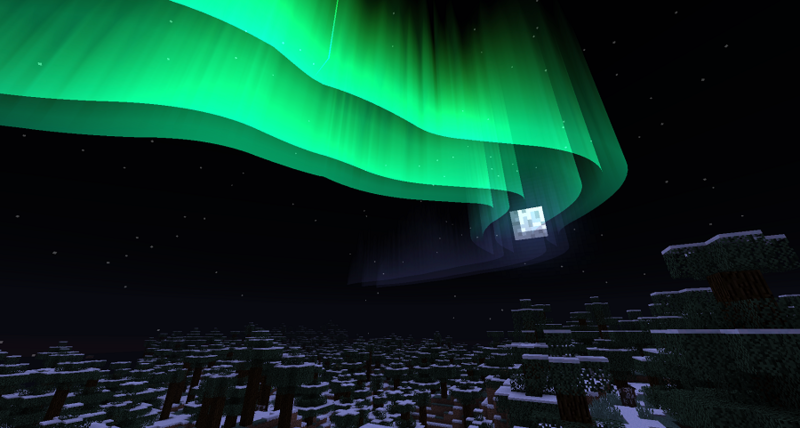 Auroras trigger at night when a player is standing in a “polar” biome such as Taiga or Ice Field. The size, shape, and coloration can change per Aurora spawned. Lava can form lava jets on the surface which spout fire or sparks. Bubbles can rise from the bottom of lakes, oceans, and ponds. Soul Sand can trigger demonic laughter. Wooden planks can squeak when walked upon. Dust motes can fall from various blocks. Steam will rise from water because of nearby lava. Fireflies will spawn at night around various plants in temperate biomes. Waterfall splash effects/sounds for flowing water. Presence Footsteps is integrated directly within Dynamic Surroundings. This feature generates different footstep sounds as the player walks and jumps. The sounds played are based upon the material that the player is standing on or moving through as well as the armor they are wearing. Damage/Heal pop offs. Whenever a mob gets hurt or is healed a pop-off particle will fly off around the mob indicating the amount of change. Weapon/tool swoosh. A sound gets played when swinging around a weapon or tool. Jump. A “huh” sound will play when jumping. Bow pull. A sound gets played when a player pulls back on a bow. Crafting sound. Plays when an item is crafted by the player. Heartbeat. When a players health drops to 40% or less Steve’s heart begins to beat loudly. Hunger. When a players food bar drops to 40% or less the stomach beings to rumble. Potion particle swirls. Can be turned off so they don’t interfere with the players field of view. Screenshots can be found in the Image tab! Ello, first of all, great mod! I wanted to ask how easy is to add an item to play a sound, to be specific, I installed PlusTic that adds the Katana and some other weapons to Tinkers construct and it doesn't seem to register the swing sounds to play, which makes it really weird. Is that easily editable and if so how can I do it? After trying out this mod, I can't seem to be able to play without it. Minecraft seems so silent and dead. Which is why it was painful to learn that it is apparently incompatible with serene seasons, causing a crash when loading worlds. something about serene seasons unable to "find temperature." Conflicting code between the mods I guess? Is there a way to fix this? Is it a simple fix? If so could you possibly release a patch when you have time? // Why did you do that?// Why did you do that? Sorry for not seeing this sooner. I don't check this page often. I usually lurk on the project page for the mod. The Serene Seasons devs have been updating their API which unfortunately broke DS. Make sure you update the latest Serene Seasons and DS JARs and you should be good. Ok so do you mean update to the latest "stable version" (which on this page you stated was the 4.x branch) or the latest 5.x version (which is the "development" branch) ?? Thanks for actually replying, you don't see that a lot in modders (of any game really). Edit: Also are the Betas stable enough to use in survival? Or are they strictly in test phase at this point? Edit 2: I had no idea that serene seasons had updated. I did as you said and updated both to the latest stable versions, and the reason it wasn't working at first/ before is I didn't delete the core that the old DS versions generate in the mod sub folder (I suddenly remembered when you said update all JARs lol). Thanks for the help, it was killing me not being able to use both mods. Cheers mate. Hello, I have a problem with compatibility with Sound Physics mod. Starting with version 1.11.2-3.4.7.2, the sound of footsteps and some other sounds do not sound. Earlier I made a resource pack that replaces all sounds from your mod to mono instead of stereo, because this is a requirement for Sound Physics, and everything worked fine on version 1.11.2-3.4.7.1 (so on MC 1.11 I use this version). But now I moved it all to MC 1.12 for some reason, so I can only use the 1.12.2-3.4.7.2 version in which I ran into the same problem. I tried to update my resource pack and add there all the missing sounds (in mono of course), but it did not work. So can you tell me the difference between versions 3.4.7.1 and 3.4.7.2? Maybe then I can fix it. PS. Sorry for possible mistakes English is not my primary language. For 1.12.2 I loaded up a version of Sound Physics using my latest BETA posted to CurseForge. The footsteps are there, but are very mute. Sound Physics adjusts the volume at the surface to be very low - not sure why the mod does that. In general I view Sound Physics as incompatible because of things like this. I personally use Sound Filters which doesn't do this type of thing. Thanks for the answer. But I still would like to find a solution to this problem, because on the previous version of your mod all worked perfectly. If you tell me what the difference is between these versions (I mean 3.4.7.1 and 3.4.7.2), this will help me a lot. As it relates to sounds the only thing that changed was that footsteps and other player related sound effects (such as jumping and footsteps) were made non-attenuated. I am putting in a hack to change the sound attributes if Sound Physics is installed. The L/R handling of sounds *may* be a little off for footprints, but nothing I can do about that. I have Self Planting disabled in Craft++ and Entity Emojis disabled in Dynamic Surroundings and the issue persists. LMK if you need more info or the full crash log. You report this to the author of Craft++? Yes, haven't heard back yet. However, I noticed that using my previous copy of DynamicSurroundings-1.10.2-3.3.5.2 does not result in crashing. Is Animal Emoji a feature that was changed significantly between that version and the newer DynamicSurroundings-1.10.2-3.4.7.2? Nope. I haven't touched the capability in quite some time. - is it possible to change battlemusic sound file? And/or possible to add a play sound event when entering a battle? - Is it possible to add config to trigger sound files to certain events ingame, like fullmoon, day and night start? Yes. It would require making a resource pack and adding a config file that DS can read and apply. It's not a simple thing like changing some entries in the dsurround.cfg file. It's on my TODO list to make some sort of tutorial to describe how this is done. Actually that is how Dynamic Surroundings works. A sound is eligible to play if it's condition expression evaluates TRUE. This expression is made up of boolean variables based on the current state of the game. You can take a look at the config file for Minecraft proper to see what is possible. Every time I walk near waterfalls, my footsteps get muted. Is there a way to prioritize footstep noises over waterfall noises? Waterfall sounds can be loud depending on the strength. If sufficiently loud they can drown out the footstep sounds. Hello, I really recommend you to improve the Aurora part. Clearly, Aurora part can be improved a lot. This is what they look like where I live.